Taking that spark of imagination and transforming it into sound is the most fundamental, exhilarating part of creating music. Pigments makes that process natural, intuitive, and colorful. Imagine a sound, then create it. Pigments gives you the finest elements ever found in a software instrument, letting you create pioneering, exciting, and deeply personal sounds. Laying everything out before you, Pigments lets you fully express your creativity in a way that’s never been seen before in a software instrument. Pigments features a twin audio engine, letting you mix virtual analog and wavetable oscillators to create the perfect starting point for your patch. You can even morph wavetables, or import your own. What you do next is up to you. Experiment with 3 envelopes, 3 LFOs, and 3 function generators. 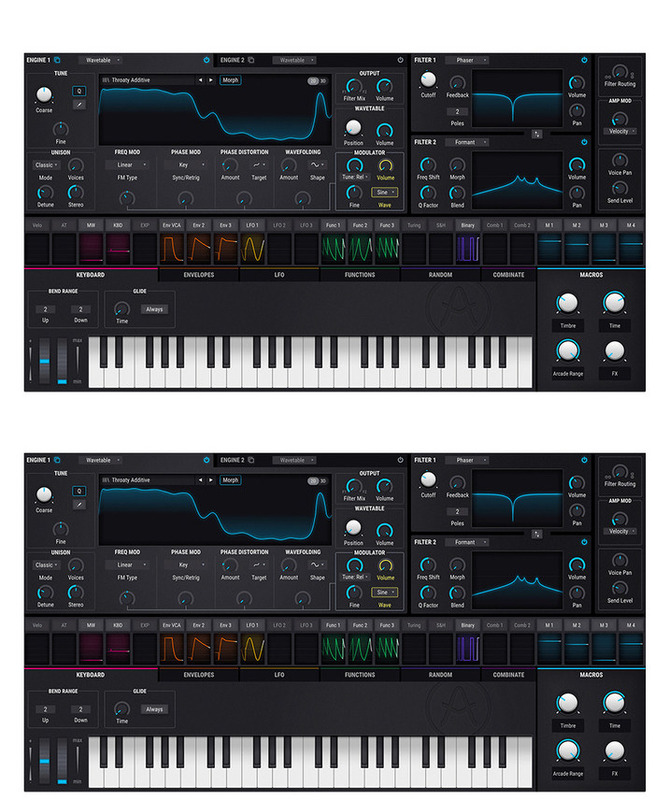 Assign modulators to animate your sound, and breathe life into it. Add controlled, or totally wild random changes to any parameter with a Turing probability generator. Run it through 2 filters, with any combination of iconic analog filters or modern formant and surgeon filters you want. Process your patch with exciting contemporary effects like wavefolder and multifilter, or vintage studio reverbs, delays, and EQs. For 20 years, we have been analyzing, emulating, and refining the most iconic synthesizers ever made. Working with Dr Robert Moog, Cameron Jones, and many other industry legends, we have built our reputation on creating world-class instruments. We turned the music industry on its head with the release of our trailblazing, affordable analog hardware synthesizer, the MiniBrute. With multiple awards under our belt, you could say that we’ve done our homework. Pigments combines our passion for vintage FM and analog sound with modern wavetable synthesis to create what is, to us, the ultimate software synth. Graphical editing, sourcebased or destinationbased. Now everything works as it should. This time a more in deep reverse job was done. Remember to use “sudo codesign -fs /Library/Audio/Plug-Ins/Components/Pigments.component/Contents/Resources/plugin.vst3/Contents/MacOS/Pigment” command before loading it into Logic.